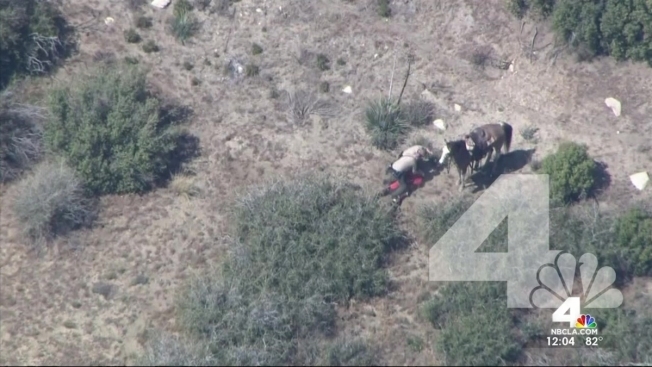 The San Bernardino Sheriff's Department on Monday publicly named the deputies involved in the April beating of a man who was evading officers on horseback — a beating filmed exclusively by NBC4. All 10 deputies were named in a news release. The deputies were placed on administrative leave April 10, one day after an NBC4 News helicopter filmed them beating 30-year-old Francis Pusok at the end of a long pursuit in San Bernardino County. Deputies beat Pusok, of Apple Valley, after he led them on a nearly three-hour pursuit that began when authorities tried to serve a warrant in an identity theft investigation Pusok's attorney said had nothing to do with him. San Bernardino County Sheriff John McMahon told NBC4 on Monday that the video caused so much outrage and sparked death threats against the deputies, which is why the names were not released earlier. The department released names after looking into the threats, and is still investigating the video. "It does take awhile and the process is lengthy at times, but trust us, we will get to the bottom of it," McMahon said. "And we will continue to investigate fairly and thoroughly, and make sure we will give a quality report that's thorough to the district attorney's office." McMahon said the department is analyzing the video to see which deputies played what roles in the confrontation and whether it can be deemed as excessive force. Before settling with the county for $650,000 on April 21, Pusok spoke to NBC4 about the arrest, which prompted a federal civil rights probe. Sheriff's officials had declined to comment about Pusok's allegations, citing the ongoing investigation, but McMahon said earlier that the video of the arrest appeared excessive. "I assure you that if there's any criminal wrongdoing on the part of any of our deputy sheriffs or any policy violations, we will take action," McMahon said last month. According to the terms of the settlement unanimously approved by the board of supervisors in closed session and by Pusok and his attorney, the county acknowledged no wrongdoing.